Cinema has confirmed it – the 32 white steps leading up to Asiatic Library is one of the most romantic spots in the city. If your SO has a penchant for old books, cinematic references and a love for Mumbai, your popping the question at the Asiatic Library will most likely have a favourable answer. P.S. In the moonlight would be the best option. A little out of the way, Vasai Fort is a beautiful wonderland which makes for the perfect date and backdrop for a successful proposal. Find here an old fort, a church, a gorgeous pond, lilting mangrove trees, and even a sneaky view of the Arabian sea. You may find it hard to convince the other about why you’re going all the way to Vasai Fort for ‘no special reason’, but once you get past that, it’s smooth sailing. The stunning Royal Opera House sets just the right mood for grand gestures of love. At this newly restored building, the beautiful stained glass windows, massive structure, deep-red upholstery and baroque work on the walls make it a most romantic place. Take your date on an opera night, and book yourselves the royal box for two. When the time is right, you know what to do, don’t you? Nothing quite like being up in the air in a colourful hot air balloon, is there? There’s a place near Lonavala where you can go on a hot air balloon ride and fly above the valley. Get more details here. 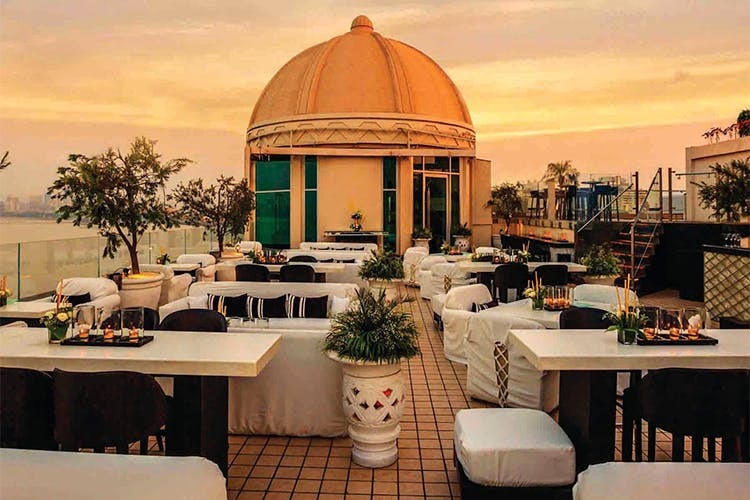 A gorgeous sunrise is an almost guarantee to a ‘yes’ and you can get the best one at Raj Bhavan in Malabar Hill. It is the residence of the governor of Maharashtra and is 50 acres of beautiful lands, greenery (hard to find in this city) and peace. Live out your La La Land fantasies by taking your partner on an out-of-the-world date to Nehru Planetarium. You can pop the question in the observatory to be part of the starry show, or you can surprise your SO in the middle of the maze in the museum. Some good food and fine wine isn’t always enough. Throw in a great rooftop and a sea view, however, and everything changes (for the better). We suggest looking at Dome at Intercontinental as one of your options for proposal spots as it has a beautiful view of the Arabian Sea. A mill not-so-known, Mukesh Mills has been the backdrop of many a movie shoots in Mumbai and has recently opened for rent. This beautiful space that overlooks the sea has three sections that make for the most out-of-the-box proposal spot – a hall attached to a garden and a sea-side area where you can set up your own idea of a proposal dinner table. To rent out the space, contact the executives at Mukesh Mills on 022-22825582.